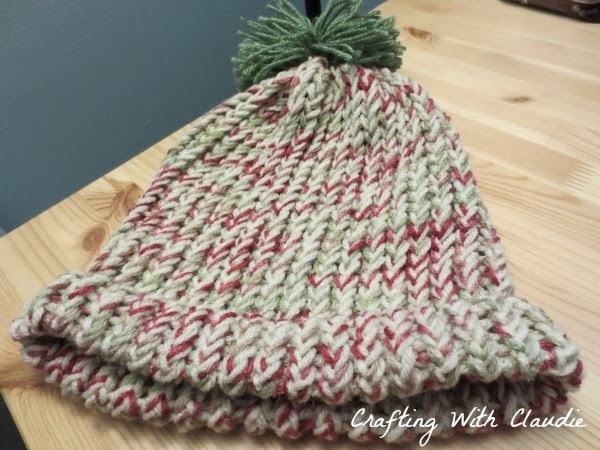 Crafting With Claudie: Tada! Hat! I do have photos though. Yay! In a recent video,, I showed off some scarves I made. Three of them were made with a long loom and they were made for a charity. 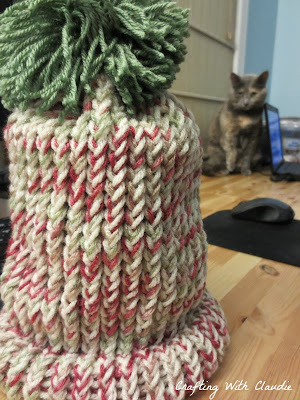 Well, I decided to use some of the remaining yarn to make a hat. I was trying to catch up on Reign and Supernatural so I broke out the round loom and set to work. Can you see my cat Olive there in the background? My husband informs me that is her "Soon" face. She's adorable though...even if she does look like she wants to tear the hat apart. I'll be making more hats and scarves for charity (along with all of the gift giving projects I have on my list) so I'm going to be quite busy these next few weeks. It's all good though. When I use up yarn, I get to buy more after all!